Janet Mallon Schwahn says her family’s legacy at Marquette set the future for her — she felt a clear connection to her Jesuit uncle, Rev. Charles E. Mallon, S.J., and the principles he held. “I always wanted to do some kind of work that enabled me to help someone,” she says. For the past 50-plus years, Janet has found several ways to do so. Since high school, she has consistently led her peers. At Holy Angels Academy, Janet was freshman class president, and at Marquette, she was elected to the junior/senior co-ed board. After earning her bachelor’s degree in speech, she worked as a speech therapist in Crystal Lake, Ill., and Milwaukee Public Schools until she met her husband, Al Schwahn, Bus Ad ’50. Together, they started a family and raised their two children. After the untimely death of her husband in 1971, she and her children moved back to Brookfield to be nearer to her family. She took a job in Burlington, Wis., and commuted from Brookfield for the next 25 years. 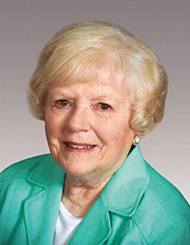 Janet was a committed member of the AMUW board and served as president in 1964–65. Under her leadership, the Mary Neville Bielefeld Award — the very award she’s receiving — was created to honor distinguished Marquette alumnae. Now an Elm Grove, Wis., resident, Janet prepares monthly meals for the underprivileged and knits shawls for the sick at St. John Vianney Parish in Brookfield. She also has served on several reunion committees for both alma maters. Janet’s pride lies in the rich relationships she maintains with her children, relatives and very close friends. Through her family, the legacy of service and leadership endures. The Marquette faculty member who had an impact on Janet: Rev. Norbert Loehr, S.J. Favorite Marquette memory: Serving on the junior/senior coed board and being chair of the Holly Ball her senior year. In grade school, Janet wanted to do some kind of work that enabled her to help someone.